Can Difficulty Concentrating Lead to Mood Swings? Difficulty concentrating is one of the lesser-known symptoms of menopause. Characterized by short attention span and difficulties absorbing, processing, and recalling information, concentration issues can lead to a host of problems in the workplace and also hinder the enjoyment of pleasures that require mental engagement, such as reading or watching a movie. There are emotional impacts of concentration difficulties, too, and the frustrating, draining nature of the symptom is likely to affect a woman's mood. Keep reading to understand the reason why difficulty concentrating occurs during perimenopause and the relation it has to mood. Concentration is a skill dictated by the activity of the cognitive functions in the brain. These control general mental sharpness, incorporating learning function, the formation of memories, and the recalling of information. Estrogen levels influence the cognitive functions by regulating the activity of neurotransmitters and parts of the brain connected to memory. When a woman is in her forties and early fifties (i.e., perimenopause), estrogen production declines as the body prepares to cease menstruation. This creates a hormonal imbalance that can potentially impair the cognitive functions, making concentration, adaptation to changes in routine, and processing, storing, and consciously retrieving information difficult. 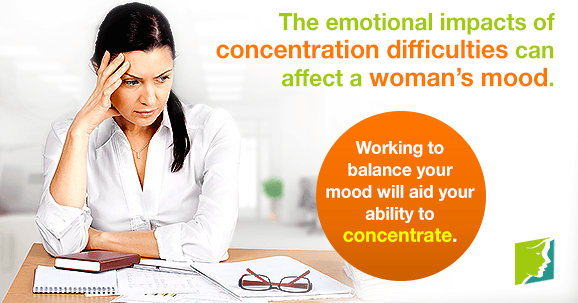 Like the cognitive functions, mood is influenced by estrogen levels and is susceptible to change during perimenopause. It is thought that estrogen affects the production, release, and activity of serotonin and endorphins (i.e., “feel-good” neurotransmitters in the brain). When estrogen levels fluctuate, the activity of these neurotransmitters becomes irregular as a result, meaning that sporadic, extreme, and abrupt changes of mood might occur. These are known as mood swings, and commonly come in phases of irritability, heightened emotional sensitivity, crying, and feelings of sadness. While the cause of mood swings is primarily hormonal, the changes in mood are usually triggered by frustrating or upsetting episodes. Difficulty concentrating is one such infuriating episode. When information simply won't sink in due to restlessness, disinterest, or difficulty absorbing it, this is likely to induce irritability and consequential mood swings. Problematically, mood swings can also trigger or worsen concentration problems; in this way, the symptoms are mutually exacerbating. Mood swings often cause distraction, lack of interest, and tiredness that makes it hard to absorb information and later recall it. If swings come with tiredness, this effect will most likely be amplified. While concentration issues and mood are mutually impacting, this can work in your favor when it comes to combating them; if you work to improve concentration problems, this will reduce mood swings, and similarly, working to balance your mood will aid your ability to concentrate. Find brain-stimulating activities to improve mental sharpness and positive lifestyle changes that promote long-term contentment. Read about different ways to treat concentration problems.